The present generation has lost many scientific secrets and sciences of our ancients, unfortunately. Though we might boast of the inventions of our age, it is an undeniable fact that – the Vedic people were more advanced and more mature than the present generation, in every angle. The ancient Hindus, in fact, had more advanced sciences and technologies against what we have now. But, unfortunately, we have lost them all! Every branch of science and technology what we have now was present in the Vedic times and a lot more too especially the subtitler sciences. Astrology is one such science that has been lost. The present so called scholars claim that there is no concrete evidence to consider astrology as a science. But, the mere fact that we are unable to find or see the evidence does not imply that there is no evidence at all. We are unable to see or simply we are impotent to find the evidence. Our knowledge and understanding are not sufficient to find the evidence - that’s all. The ancients were so advanced in astronomy that they had the evidence and understanding behind – how the planets and stars could influence the persons and things on the Earth. The ancient Hindus had contacts with the beings in other universes and were visiting the other universes too but, we don’t have the knowledge about our solar system too in complete, we are still in the stage of discovering the solar system, sending spacecraft's to the nearby planets..! So, no wonder that - our scholars and scientists fail to find the evidence for the science of astrology at present. Astrology was not written by ordinary people like us. 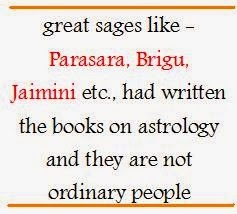 The great sages like – Parasara, Brigu, Jaimini etc., had written the books on astrology and these are not ordinary sages. Can’t they think as much we do…? Just we are worms before their might. If people of that caliber say something there should be some deeper logic in that but, of course, we might not understand it – and it is quite natural. This is due to the [intellectual] maturity differences between them and ‘us’. If we fail to understand their sayings and doings – simply we must not suspect them but, nothing wrong in trying to understand them – losing belief or not believing is wrong. Astrology is not baseless. Astrology is applied astronomy. Even the great scientist of the modern age, Sir Isaac Newton had firmly believed in astrology and even he had written books on astrology. 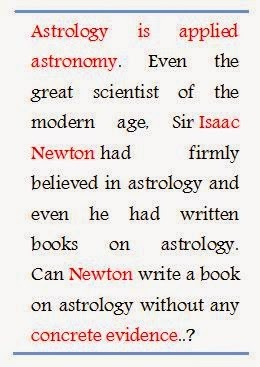 Can Newton write a book on astrology without any concrete evidence..? We don’t have the proper understanding of the astronomy but, the ancients had such understanding of astronomy to bring out the science of astrology. Just, we lost their knowledge as in the case of many other sciences and on the other hand, we are unable to find or get that understanding on our own, unfortunately. The reason for disbelief on astrology is due to the false astrologers of our age. Though it is unfortunate, it is a fact that astrology too has become a business as are all things. 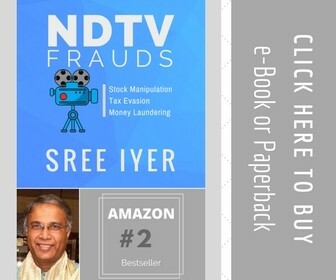 So, in order to gain money many cunning people are forecasting or are doing business in the name of astrology thought they don’t know the basics of it, let aside knowing the secrets of astrology. Another point is that – though there are some common astrological influences on all the people - the daily, weekly, monthly and yearly predictions as given by the news papers and magazines – are all farce and are not a proper way of prediction according to the Vedic astrology, though these fancy predictions might come true accidentally. The predictions should be given to each individual separately – for the predictions to come true but, of course in certain cases the group predictions too is possible – that is a different case altogether and is not related to the media predictions in any way. These days, if you go to an astrologer - she or he will tell you something and takes the fees from you. But, out of their sayings, only one or two will happen, others will not happen naturally. This is because – the present astrologers are not good at astrology. I am not saying they don’t know the subject but, they don’t know it well. If I know only the basics of astrology and forecast then – I will naturally go wrong, because the advanced things in astrology will quite differ with the basics many times. So, naturally, I will go wrong. But, the majority of the astrologers don’t know the advanced principles in astrology. So, they naturally go wrong and the common people start to suspect them and their science too. But, nothing is wrong in the Vedic science of astrology. 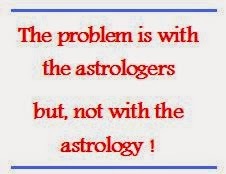 The problem is with the astrologers but, not with the astrology. Another thing is that – the ancient Hindus had the practice of writing ONLY the general things in books and giving the secrets to only the disciples. So, in astrology too – the secrets were not present in the ancient books as the secrets are held up with the gurus. 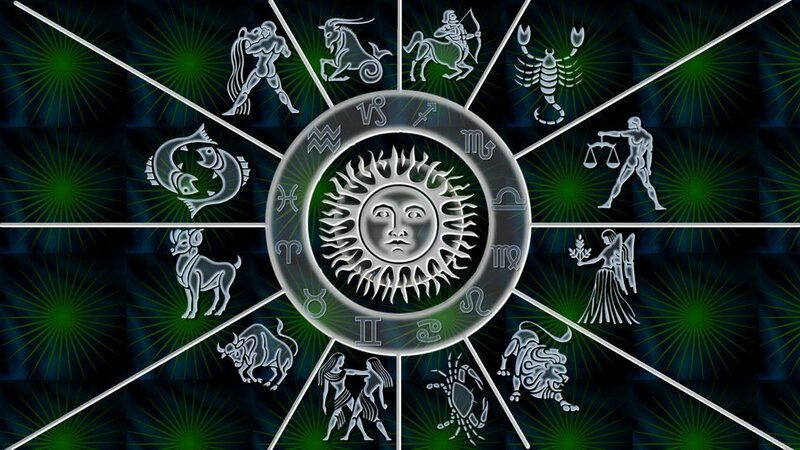 Unless the secrets are learnt from the astrology gurus – there is no way to master astrology and predict properly. So, nothing is wrong with the science of Vedic Astrology, for sure..! But, finding the REAL astrologer is almost impossible these days. If you could get a genuine astrologer – you can know everything about your life with atomic precision, without doubt. Decent! On account of sharing the information...If you need arrangement of your issues and live peace full life at that point Indian Astrologer in Sydney | Astrologer Services in Sydney | Astrology Personal Consulting Services in Sydney is best choice for you.